Blog » Hidden Data Center Dangers: Does Your Data Center Have Zinc Whiskers? Hidden Data Center Dangers: Does Your Data Center Have Zinc Whiskers? Does your data center have zinc whiskers? Although commonly found in mostly older data centers, zinc whiskers are a serious problem. Zinc whiskers are one of those data center problems that can lead to a cascade of other problems – like unexplained data corruption issues or hardware failures with disk drives and power supplies. Today, we’re going to explain why your data center may need to undergo zinc whisker remediation to ensure efficient operation. -Are you experiencing unexplained hardware failures and breakdowns, especially with disk drives and power supplies? -Are you experiencing mysterious data corruption issues? -Do problems seem more frequent and serious after you’ve moved equipment? Does the frequency increase after you work in the underfloor? If you’re experiencing any of the above problems, then your data center may have zinc whiskers, a real and pressing problem related to metal growth in your data center. It sounds weird, but it’s something that you need to pay close attention to. Zinc whiskers are a problem that occurs on the bare metal surfaces of access flooring systems. It’s particularly common in wood-core and concrete-core computer room flooring panels. You may also see zinc whiskers around pedestals, stringers and even in the ceiling. They are a result of the galvanized method used with a particular raw material. Typically, zinc whiskers grow on the underside – the plenum side – of your floor panels. Zinc whiskers start off almost microscopically small. When they first emerge, they can be just 1 or 2 microns in diameter. Over years of unchecked growth, however, they can grow to reach several millimeters in length. Why Are Zinc Whiskers Dangerous? When whiskers stay attached to a floor panel or pedestal, they’re pretty much benign and pose little risk to your data center. However, when whiskers break free, they can enter the air of your data center, at which point they’ll begin to circulate freely throughout your facility, getting blown into your equipment and causing all sorts of troubles. You can probably guess why zinc whiskers are a problem: zinc is not just a metal, but it’s one of those metals that’s a good conductor of electricity. When zinc whiskers fly around the surface of your data center and lodge themselves in your hardware, it can cause a short. The worst part about zinc whiskers is that the short is typically an intermittent short. The zinc whiskers aren’t large enough to cause more serious damage. This makes the problem difficult to detect and fix. They’re also small enough to slide right through most case fans: you actually need a HEPA filter to stop zinc whiskers from entering your hardware. However, by learning to spot the symptoms of zinc whisker problems, you can diagnose your problem. There are two ways to spot a zinc whisker problem. One, you can pay attention to your servers and keep an eye on their maintenance concerns. Or two, you can visually inspect your floor panels and pedestals. -Rest your floor tile on its edge and give it a close visual inspection, closing one eye and looking down the plane of the tile and viewing the bottom pan with a flashlight. If you have zinc whiskers, then you’ll see tiny metallic strings shining (sparkling) on the bottom of the panel. They will be approximately 1mm to 10mm in length. Whether or not you find zinc whiskers on your first inspection, you should always check multiple tiles to make sure. -Check the area around underfloor components and pedestals for similar-looking whiskers. It may help to do this with a flashlight in a darkened room. 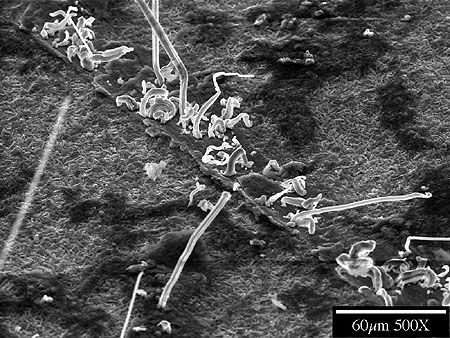 -If you want to be extra cautious, consider reviewing field samples using Scanning Electron Microscopy (SEM). This is the best way to officially determine whether or not you need zinc whisker remediation. When inspecting floor panels, make sure you’re careful not to break off the whiskers. This can cause further contamination and hardware problems. Zinc whisker problems require remediation. The process involves replacing all of the affected floor panels, including the captured panels. In some cases, companies have tried to clean or coat existing panels, although the zinc will just grow back. Coatings will also peel off when moving panels around, causing a bigger problem with contaminants. Sealco specializes in this remediation process. We’ll analyze your data center, isolate the problem, and determine the best course of action to protect your data center. To start, a Sealco specialist will perform a visual check of your facility to determine the extent and detect potential areas of exposure. Then, we’ll use that information to formalize a plan of action for safe remediation of zinc contaminants. The specific remediation process varies widely between data centers. With 30 years of data center cleaning and containment services, Sealco has the experience you need on your side. If your data center is in need of zinc whisker remediation, then Sealco specialists can perform a visual check of your facility to detect potential areas of exposure. Our experts will quickly create a plan of action to remediate zinc contaminants safely and efficiently. ← Does Your Data Center Have Never Ending Hot Spots?